I only have 2 tattoos so far. Different things in life kept me from getting more done. Anything from work, over past relationships, financial reasons and health reasons. But in a way I really regret that I did not get more done. I have been planning certain new tattoo ideas since pregnancy, but our son took priority and the things he needed. He is now two and I hope that I can get a few tattoos done before baby number two. 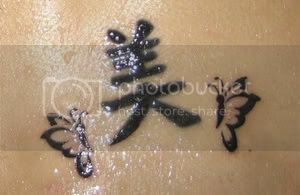 First thing I got was a kanji in 2004, that is part of my real life name, and which describes so many things to me. It can be applied to everything in life. It makes me think of one of my favorite quotes: "that which is beautiful is not always good, but that which is good is always beautiful." As you can see it was badly done. I had scarring and the color faded in no time, leaving me with white spots. I was not quite happy with the little lonely kanji on my hips, so I decided to get something added to it. I did not have anything specific in mind, but I knew I wanted it to fit with the meaning and went with butterflys. 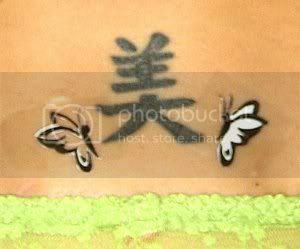 The kanji was redone and the butterflys added in early 2007 and I was happy with the outcome. My future tattoo plans are a bit different. I know many people don't care for a story or meaning behind it, but I do like to combine meaning and a design I like. I will share them when I can. I do love the quote though. It makes me think and it's very deep for me.